Well, Monkeyflowers, anyway. To be precise, Winged Monkeyflowers (Mimulus alatus). This native perennial wildflower has been showing up here and there on my active floodplain ever since we started tending this yard in 1989. But this year’s uncharacteristically wet summer resulted in a veritable explosion of violet blossoms. The yellow and white throat patch gives the flowers an orchid-like appearance. Very showy, in my opinion, for a wildflower. The winged aspect refers to the small wings on the petioles (leaf stems), bits of tissue that flare out on either side of the stems, a bit like wings — at least to the eyes of the botanist who named this flower. If you zoom in on the photo by clicking on it, you can just make out the wings on the petioles. 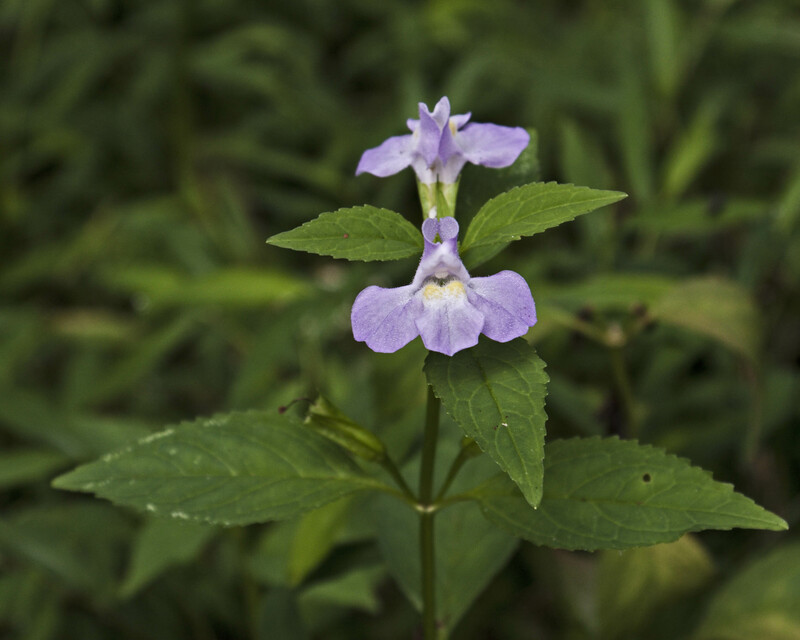 The common name apparently arose because someone decided the flower shape and coloring resembled the face of a monkey. Personally, I don’t see it. 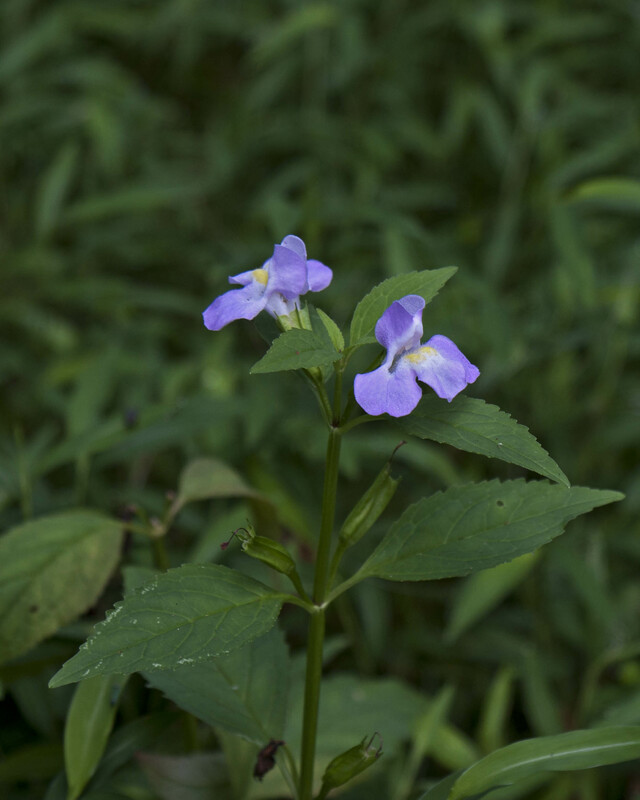 What I see is a lovely 1-3-foot bright green opposite-leaved plant covered in showy pale violet flowers. 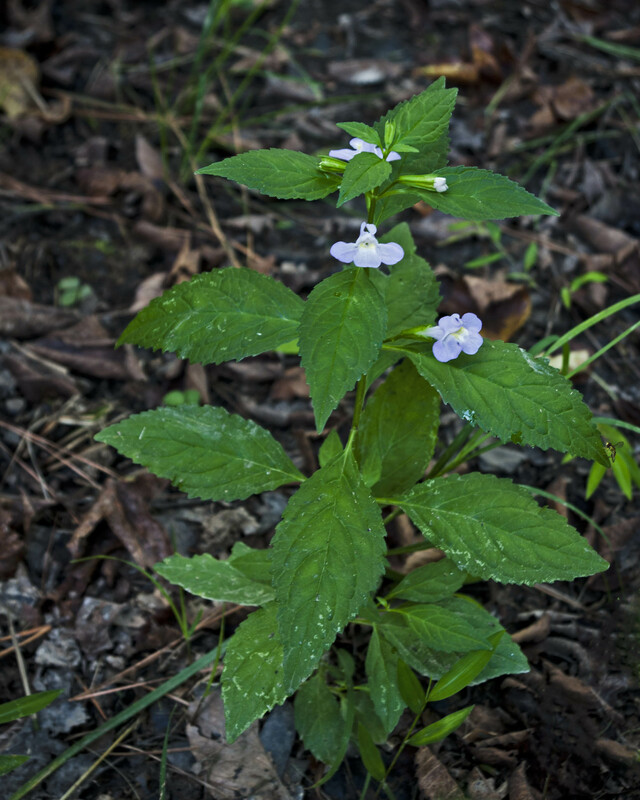 You’ll find this relatively common wildflower in consistently wet areas throughout most of the eastern United States. It has a relatively lengthy bloom period, from mid-summer to early fall. My monkeys finished blooming by mid-September. I didn’t plant them. I assume floodwaters deposited seeds some years ago. They can spread a bit by rhizomes as well, and certainly in my yard, I have distinct patches of these beauties, as well as odd singles popping up here and there, often near Cardinal Flowers. The two species look fabulous together, especially when backed by early-blooming goldenrods. 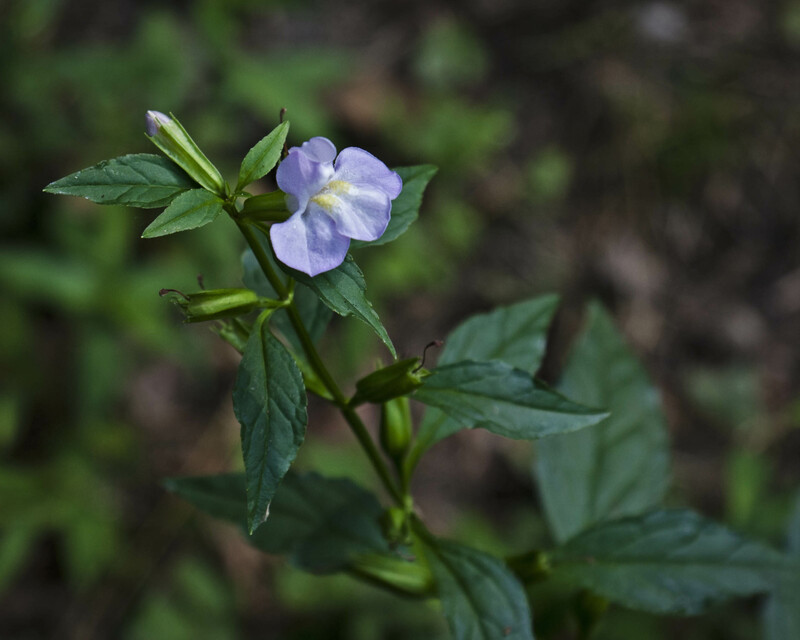 The distinctive opposite-leaved structure of this wildflower makes it easy to identify. To be happy, Winged Monkeyflowers require wet to consistently moist conditions and rich soil with abundant organic matter. They will thrive in full sun and light shade. If they look small and yellowish, they probably are getting too dry and hot. Mine were greenly lush this year, and astonishingly floriferous. Winged Monkeyflowers prefer undisturbed wetlands, but mine are doing just fine despite significant disturbance from several floods this year. I suspect they would do very well as rain garden plants, and you can find commercial sources for this species, though it takes a bit of research. If you’ve got a consistently moist spot in a bit of light shade, I would encourage you to try these long-blooming, showy wildflowers. They don’t have any fragrance, but bumblebees and other pollinators adore them anyway. They must not taste good, because mine are wholly unprotected and often surrounded by fresh deer tracks, yet remain uneaten. And who can resist being able to brag about growing Winged Monkeys? At least that’s always where my admittedly strange mind goes — to Oz — when I spot one of these lovelies. This entry was posted on September 30, 2013, 10:39 am and is filed under Favorite Plants, Native Wildlife, piedmont gardening. You can follow any responses to this entry through RSS 2.0. You can skip to the end and leave a response. Pinging is currently not allowed.